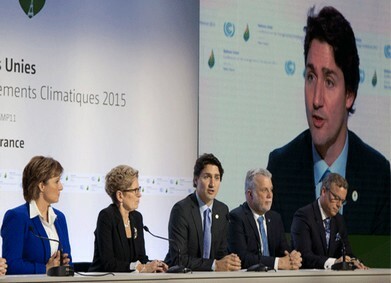 Prime Minister Trudeau promised to be a climate leader. There is no issue more important to Canadians than protecting a safe climate. But subsequent to pretending leadership at the COP in Paris, Justin Trudeau has failed miserably at emission reduction. The Liberal's Pan-Canadian Framework mitigation plan is in tatters; the puny, ineffectual carbon pricing proposed turned into a tool for dividing Canadians. Canada will not meet its Paris 2030 target - which was the old Harper-era too low by half measure to stay even below 2°C target. Canada must reduce GHG emissions by half (at least) by 2030, but instead we dither, wasting very precious time. And the world needed leadership post-Paris, but our Canadian government had other intentions. While failing to lead in needed emission reduction Trudeau has done everything in his power to expand fossil fuel production in Canada including buying the Trans Mountain pipeline. Trudeau has kept expanding fossil fuel production as his government's climate frame instead of effective mitigation and as a result key constituencies continue to push for new fossil infrastructure when we surely should know better. With Hothouse Earth threatening all of our futures and as close as another decade of failed mitigation, Canada has perversely led at not taking climate seriously. Canada, the worlds sixth largest producer of fossil fuels, has led in ignoring the need to wind down fossil fuel production with our PM being widely quoted about how nobody would leave 173 billion barrels of oil in the ground. Enough. The pretend climate leadership would be laughable if not so tragic. Climate mitigation is a life and death issue. Trudeau must resign. Those who do take climate seriously must force Trudeau to resign in this election year to show the world that failure at climate mitigation - while stoking fossil fuel expansion - is not acceptable and will be punished. Politicians world-wide must change their ways and throw off the petrostate corruption and actually lead in keeping fossil fuels in the ground and carbon out of our atmosphere before it is too late. Realistically, most ENGOS and most politically active people are not going to be supportive - they are working for what a Liberal government might do, and dread a return of the Conservatives. But youth activists who do take climate seriously, and those activists who recognize how important the example of a forced ministerial resignation for climate mitigation failure could be globally, may support such a campaign. The case against Trudeau is dynamite and should provoke media coverage, and could force Trudeau and the Liberals into a difficult defense and real consciousness raising, (while not really helping the denier Conservatives). If you are informed and serious about climate change, if you recognize the now existential dangers and support government leading in effective mitigation, and you recognize that real change is needed urgently: Justin Trudeau, the pretend climate leader, must be forced to resign. We need a Green New Deal with managed decline teeth and leadership from Canada to help get us there.